If we start with the premise that points are an estimate of effort and not a measure of value then estimating effort (story points) for every work item type helps teams better plan the workload. When some items have effort estimates and others do not, planning becomes subjective and teams frequently struggle with meeting their forecasts. My advice to teams is to estimate (i.e., assign points) everything and to recognize that velocity is the rate at which the team does fully tested, clean, quality work. Velocity is not something teams earn or get rewarded for – for example, saying the team earned 50 hours of effort estimate makes no sense. My advice to managers is to not equate effort with value – one does not cause nor necessarily lead to the other. Team velocity is just a raw measure of speed, nothing else – I know that the team delivers 50 points a sprint but that doesn’t tell me if any of that work is valuable or not. If managers/stakeholders are really interested in determining the percentage of time spent on value-add work then teams can simply flag an item as value-add or not. Of course, determining value is easier said than done because (1) value is not a constant and changes over time, (2) stories by themselves don’t always provide value but do so in concert with other stories, and (3) in many domains value added by a feature isn’t measured objectively and is hard to isolate from value added by other features delivered. Keep things simple and don’t try to guess eventual dollar value delivered/earned/saved by each story — it is an exercise in futility. With that said, lean does provide guidance on classifying activities as value-add, non-value-add but necessary, and pure waste. Agile teams can use the same when/if they want to determine how much time they are spending on true value-add work. Ancillary activities like HR, Payroll, etc. 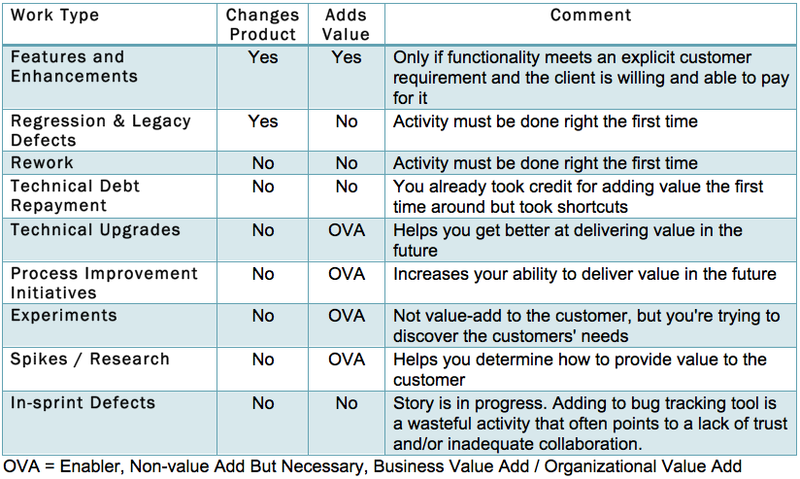 The following table is my quick and dirty attempt at listing some of the software development activities and classifying them as value-add or not. How do you treat velocity and value identification? Have you seen dysfunctional behavior caused by an over-emphasis on velocity and a constant pressure to increase velocity?